To use the traditional promotional pen or t-shirt is to give your customers what they expect. Being a memorable and interesting brand is to give the unexpected, be unique and give promotional dental care products to your customers or target audience! These can be used for a variety of occasions and purposes. As customer gifts from the dentist, for hotels, or as part of hygiene themed gift bags. These bags could contain other products such as manicure sets, towels and bath sets. 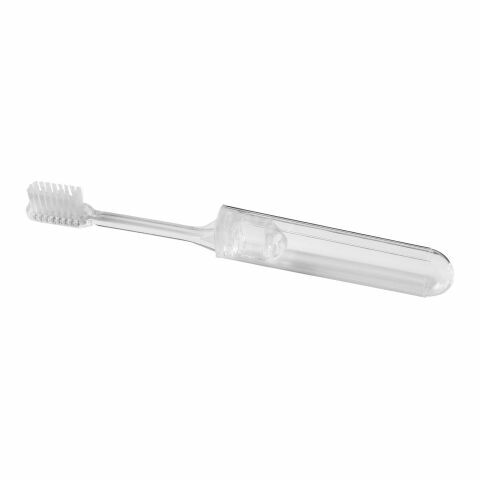 In our online shop you will find a variety of dental care accessories, that are characterised by their usefulness and simple elegance. This could appeal to any demographic because we all need to clean our teeth! Anyone would be thankful for receiving such useful items. The large advertising surface offers plenty of space and can be custom printed. It is important for all businesses to explore the use of custom promotional products in building their brand. Little giveaway items serve a number of puporses, especially in the health and medical industry! For example, surgical practices often have a reputation of being a bit cold and sterile. Much like a doctor would give a nervous child a sweet to make them less scarded of the doctors, you can give all customers logo printed products to help make them feel more comfortable, appreciated and welcome. This will help to make the working environment and overall more friendly and fun place! Promotional healthcare products in particular work especially well in these environments (for obvious reasons!). They can tie in with a consistent message that you are trying to promote (like the importance of knowing your body and better being able to indentify when something is wrong). Custom printed plasters being given out by a local GP is a great example of this. They are useful to the recipient and raises the local awareness of the business. To be original, you must give away promotional items that are unique. While your competitor's are giving out personalised t-shirts and mugs, you will be remembered for being different! The need to brush one's teeth is one that we all have, meaning the appeal of these useful products will help you reach all demographics. Oral hygiene is a regular aspect of all of our lives, which means these could be the most practical promotional tools ever! These are specifically travel sets, so they'll be suitable for people that travel a lot as the compact design of these tools make them great for taking away on trips. At allbranded you can choose from a wide range of stylish dental care products in many different attractive colours. The various models ensure that there is something for every taste. These tools are suitable for both children and adults, so they really do appeal to people of all ages! These toothbrushes can be customised, which we recommend doing, to turn these practical tools into your marketing ambassadors. Every time your clients clean their teeth, they will be faced with your branding. Use the power of useful promotional products, by distributing customised toothbrushes to your clients and business partners. Dental care products can be used in a variety of ways in your advertising strategy. They are perfectly suitable for all medical practices that want to stay in their patients permanent memory. Patients of dentists will benefit from these promotional items. Show your awareness for health and beauty through stylish gifts. The times in which promotional products have been used only as short-lived products, are a thing of the past! With practical give-aways from the field of dental care show not only that you trend toward a healthy lifestyle, but also secure a place in the awareness of your customers and patients. Place your logo on these giveaways in such a way that it is seen every day - on dental care products from allbranded. The great shade selection and shape selection of advertising merchandise gives you the possibility to choose the optimum design. Choose from our wide range of advertising media to make your logo perfect. The toothbrush holder offers the advantage that they are useful and can be used on a daily basis. They also offer a large advertising space for individual design. Dental care products are thus optimal as a promotional item for all your customers or patients who you wish to spoil with practical and memorable gifts. Stay in good memory, with your advertising on dental care accessories from allbranded. Why not put together a custom printed tins & boxes and hand them to your next customers?